It was a sad day when Jeremy Brett died. He was the best Holmes on film or television. As I look back on those ten years that Brett played Holmes, one thing has kept coming to my mind - that Brett chose to play Holmes as Doyle wrote him, and as Sidney Paget had drawn him in the pages of The Strand. It was also sad that in the beginning of the series everyone hailed it as being in true spirit of the stories, but towards the end many turned against it. These included many TV critics, and more damaging, Lady Jean Conan Doyle, the daughter of the author. This really hurt Jeremy Brett. Many critics had said Brett was not as good as he should be. If these critics had bothered to check the true facts about Brett's health, they would know the reason why: he was not up to it. In this article I will be examining the Granada series. There have been two producers, Michael Cox and June Wyndham Davies (Who is no stranger to producing Victorian crime. In 1982, she made the Sergeant Cribb series based on the Peter Lovesey novels for Granada) and 42 episodes of this acclaimed series. When the series began, Michael Cox, wanted actors who could project the image of Holmes and Watson that everyone knew from the stories, not from the stereotypes of past films and television. Cox chose two from the stage, Jeremy Brett and David Burke. Later Edward Hardwicke played Watson when Burke left. All three had done some film or television work. When Brett was asked about the role of Holmes, he said "Sherlock Holmes has undoubtedly changed me for better or worse." Michael Cox saw in Brett as the Holmes from his childhood, and saw in David Burke the qualities of Watson, a warm, witty, and inventive person. Brett often spoke about the partnership of Holmes and Watson: "To me, the Sherlock Holmes stories are about a great friendship. Without Watson, Holmes might well have burnt out on cocaine long ago. I hope the series shows how important friendship is." Edward Hardwicke, the son of the late actor Sir Cedric Hardwicke seconds the view: "Close friendships need humour and tolerance. Watson needs a sense of humour to survive Holmes' worst excesses."' This comes across in the series as both actors who played Watson developed a chemistry with Brett which is a great joy to watch. When the first series went to air the critics, the public and Sherlockians agreed that the performance of Jeremy Brett was masterfully unique. As for David Burke's performance, it was solid and intelligent. When Burke left the series to join the Royal Shakespeare Company, a new Watson was found in Edward Hardwicke. Hardwicke's Watson was much older, and became tolerant of Holmes' foibles, though still with the sense of being warm and friendly. The writers had captured the stories of the late Victorian and Edwardian times, as if you were looking into them. Michael Cox proved within a few short episodes, that he and his crew could destroy all other Holmes series that had gone before, and make this series the eternal one. It will take a long time to shake Brett's Holmes and Burke's and Hardwicke's Watson from our minds, as it took with almost 40 years of Rathbone and Bruce. Brett was always determined to seek perfection on the scripts. If the adaptors had missed out important words from the text of the stories, he would just remind them of Conan Doyle. In the early part of the series Brett kept an Illustrated edition of the complete works of Sherlock Holmes, so he could open up the book to see that the original story and illustrations were coming to life. Michael Cox, and June Wydam Davies believed that the series owed much to a team effort from the writers, actors, directors, and the crew who all made their contributions. Both Cox and Davies highly praised Jeremy Brett for being a father figure to the company. It is Brett who wanted everyone to do well and to be successful. It seems not all the critics liked Brett's Holmes, nor how the stories were made. One critic, a noted Sherlockian, Michael Pointer, said in his book, The Pictorial History of Sherlock Holmes, "Adverse critical reviews of the series may not have been taken into account and one is frequently in the position of liking particular episodes, but not Brett's Holmes." To his mind, Brett is overacting, always shouting and ranting, which he feels is not in character of Holmes. I think its Mr Pointer overreacts towards Brett. For many, Brett has always been in character as Holmes. Mr Pointer has missed the point. The series at first seems to take the standard path of telling the stories, however Holmes and Watson become real people and really develop, becoming greater heroes than those in the printed page or illustration. They had developed in such way that non-Sherlockians could enjoy the stories, the series, and the characters of the two men. An example: as Holmes comes to terms with what his drug taking has done to him in "The Devil's Foot". Another example of Mr Pointer missing the point about Holmes is that he does shout and rant at anyone or anything. A good example is when Holmes shouts at James Ryder in "The Blue Carbuncle". Another critic of the series, who at the beginning had placed her stamp of approval, was Dame Jean Conan Doyle. It is a well known fact that she does not like pastiches of her father's work. Yet, she criticises the last three full-length episodes, as well as last series made ("Memoirs"). Her criticism is that the producers of the series had changed the stories to suit themselves. The two full-lengths she was concerned about were "The Last Vampyre" ("The Sussex Vampire") and "The Eligible Bachelor" ("The Noble Bachelor"). She thought that they were too gothic. Which comes to the second point, that both Pointer and Dame Jean had missed the point, dramatisation. There are some novels and stories which are filmable, yet there are some which cannot be filmed from the written page. There are two good examples of this: Pride and Prejudice is filmable; The Trial by Kafka is not, no matter how much Orson Welles tried. Much the same goes with Conan Doyle's Sherlock Holmes stories - some are filmable, some are not. Some stories begin in the middle of the tale - "Charles Augustus Milverton", for example, or towards the end of story, like "The Noble Bachelor". To make any sense of a story, so that viewer can follow it, it must have a beginning, a middle, and an end. This is what the writers tried to do - to tell the stories so that the viewing public could easily understand the plot. Mr Pointer seems to think that another major problem with the dramatisation of these stories was that there was no 'filter', like Watson in the written stories. But we do have a filter, and it is Watson. Despite the attacks on the series, and Brett himself, I think Dame Jean would rather have American money for bad pastiches than good examples of her father's work. Conan Doyle's characters develop beyond the written page. The whole series developed to examine Victorian society in some small way: the way high society looked down at the lower levels of their society, or looking at legal acts, like the health act of 1890's, which is stated in the "The Noble Bachelor", and introducing a motor car in "The Problem of Thor Bridge". As I said before the characters did develop - Holmes, Watson and of course Mrs. Hudson. Rosalie Williams, who plays the role, shines out. She gave us more than Mrs. Hudson, coming in, and going out again. She is so much a part of things. Brett's Holmes developed as well. At first we see Holmes sitting in his chair, very much the standard screen Holmes. Then Brett changes this man from a non-human, thinking machine, to find humanity in him, to be sympathetic. Brett wanted his Holmes to be vulnerable, a wounded man who hides behinds his genius. Also, from the beginning of the series, Holmes' attitude towards women changed. He showed some small touches of emotion, however never letting his guard down for one moment. Watson had also changed in the series. At first Watson (played by Burke) was a man with normal intelligence, not the dim fellow that the American film makers had made him. Watson was one of us, and through him we saw the genius of Holmes. We too would have made same mistakes as Watson, trying to cope with all of Holmes' vices. Burke showed Watson was a caring man and a friend. The older Watson (played by Hardwicke) showed more tolerance toward Holmes, and began to show detective skills. Even the semi-regulars, like Inspectors Lestrade (played by Colin Jeavons) and Bradstreet (played by Denis Lill), and of course Mycroft, were all portrayed differently. When one thought of Inspectors of Scotland Yard in the films, they came out as dim as Watson. However,in the series, both the inspectors and others were portrayed as I think the police would work, just not looking for the unordinary, like Holmes. Even Mycroft, played by Charles Grey (in his second time as Mycroft, the first being in the film The 7% Solution) became a part of his younger brother adventures. Grey showed style as Mycroft, never running always walking, yet he was there, ready with the capture. 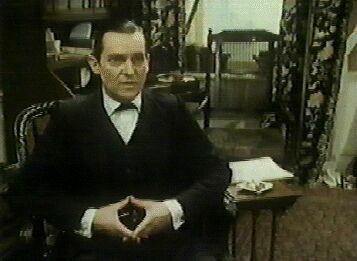 Grey appeared in four episodes of the series, including two stories that Mycroft did not originally appear in: "The Golden Pince-Nez" (which Hardwicke was unavailable due to his film work on Shadowlands as C.S.Lewis's brother, Warnie) and "The Mazarin Stone" (due to the ill health of Jeremy Brett, although Brett does appear at the beginning and end of the episode). What is also enjoyable about the watching the series, is seeing some of the great acting talents of Britain in very different roles. You wonder where you have seen her/him before? The list is endless. Here are just some of them. I spoke of Charles Grey. Other things he has done include the narrator in the film, Rocky Horror Picture Show, two James Bond films, You Only Live Twice as Henderson, and Blofeld in Diamonds Are Forever. You will find in the episode "The Naval Treaty", Gareth Thomas who was Blake in Blake's 7. Doctor Grimesby Roylott in the "The Specked Band" was played by Jeremy Kemp who was one of the orginals PC's in Z Cars, and the major baddie in the film, The 7% Solution. Poor Henry Baker, who lost his goose in the "The Blue Carbuncle", was played by Frank Middlemass, Dr Alex Ferrenby in Heartbeat, and Lionel's father in As Time Goes By. Also you will note, that the Napoleon of Crime, Professor Moriarty, played with much style by Eric Porter, who also was another famous Victorian gentleman, a man of property, Somes, from the classic, The Forysthe Saga. There was poor Reginald Musgrave, played by Michael Culver, who was Dicky Cryer in Game,Set, and Match, and seen lately as Prior Robert in Cadfael. Who would have thought, that Erskine Brown (Julian Curry) and his lovely wife Phylida (Patrica Hodge), both from Rumpole, would appear, Curry as the evil Albert Schlesinger, in "The Disappearance of Lady Frances Carfax" and Hodge as Lady Trelawney Hope in "The Second Stain". Who ever thought that kind vet from All Creatures, played by Robert Hardy, would be the worst man in London, The Master Blackmailer Charles Augustus Milverton. Not to forget John Thaw who was the one legged man, Small in The Sign of Four, a bit different from his earlier roles of Regan from the The Sweeney and Morse. That unscruplous man, the Austrian murderer Baron Gruner was played by Anthony Valentine with some relish, as he did as Tony Meres in Callan and recently as a villain in the The Knock. Lastly, there were Daniel Massey (ex brother-in-law to Brett), Robin Ellis from Poldark, Eric Sykes, Peter Barkworth, Catherine Russell, Simon Williams from Upstairs Downstairs, Peter Wyngarde from Department S and Jason King, along with Jonathan Hyde from the The Shadow of the Noose and Frank Finlay. There are have been 42 episodes of the Granada series made. What were the best episodes made? Each person would have their favourite. This is my list of the best ten episodes - what is yours? And I can say Bravo to Jeremy Brett, David Burke, Edward Hardwicke and the team. Bravo Bravo! This ends Holmes on the small screen. Next is Holmes on the big screen, from the days of silents to the first days of the talkies. Then from the famous partnership of Rathbone and Bruce up to the present day. Bunson, Matthew E, Encyclopedia Sherlockiana, 1994. Haining, Peter, Television Sherlock Holmes, 3rd ed., 1994. Pointer, Michael, The Pictorial History of Sherlock Holmes, 1991. Lane, Andrew, "Sherlock Holmes: Keeping a Brett of the Series", TV Zone Special #8, 1993. The above article (c) Damian Magee 1996. Any comments will be gratefully received by Damian at dmagee@joslib.ac.cowan.edu.au.